A display of red, green and blue tails to red, green and blue bouquets, alternating with silver, gold and purple tails to silver glitter, gold willows or crackling. Crackling comet tails are followed by a 14-shot finale of crackling tails to crackling flowers. A mixed set of four Brothers Heavy Weight 500-gram repeaters: Crime Scene, Inside Job, Blood Money, and Turf War. Get one of these four unique 14-shot, 500-gram repeaters, featuring colorful mines with unique effects. Loyal To None, starts with color breaks & snow flakes, then fires gold & silver flying fish with crackling, & finishes with three large wave shells. This is a must have cake. 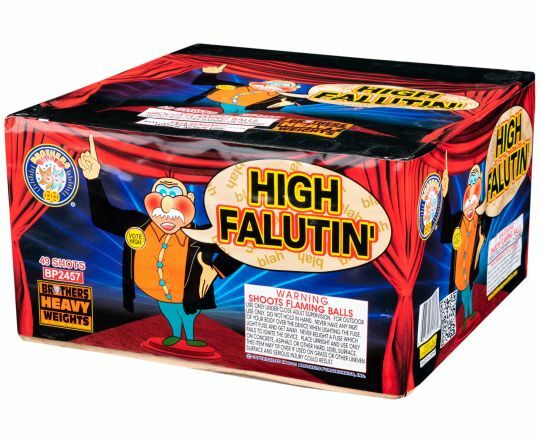 I bought 2 of these and shot both off at the same time on NYE and everyone loved it. The 14 shot finale is te best!